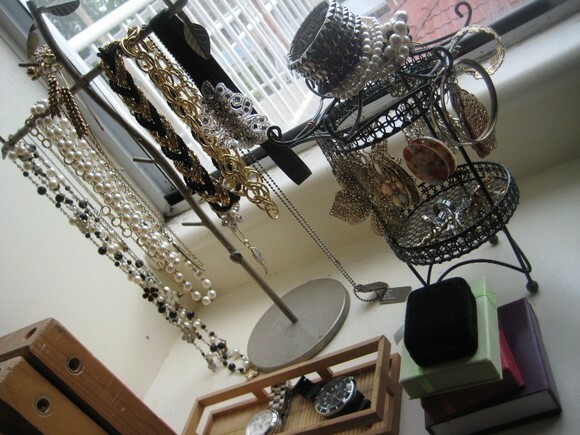 I display my costume jewelry on two jewelry stands. 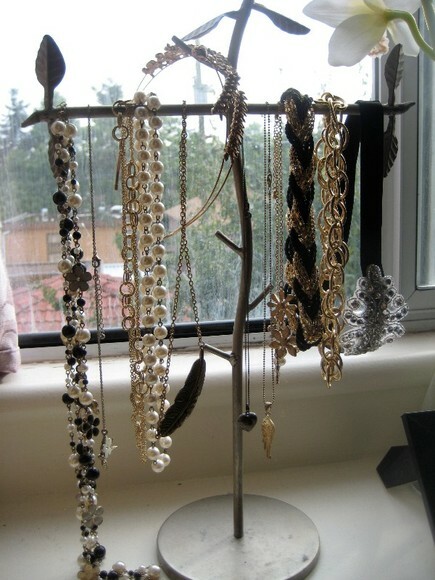 A gold tree branch stand for necklaces and black temple looking stand for bracelets, earrings and rings. Also my watches and fine jewelry (which I don't even have much of so it's not worth to show it) are in this general area. 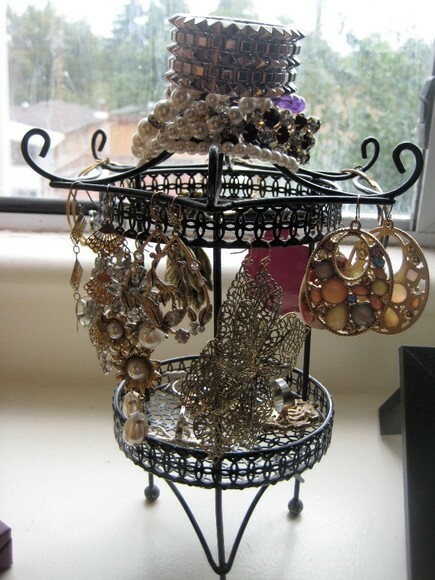 I purchased my jewelry stand to store necklaces at Forever 21 and the one to store my rings, bracelets and earrings was bought off a friend for about $5 because she wanted to clear a bunch of stuff she didn't use. 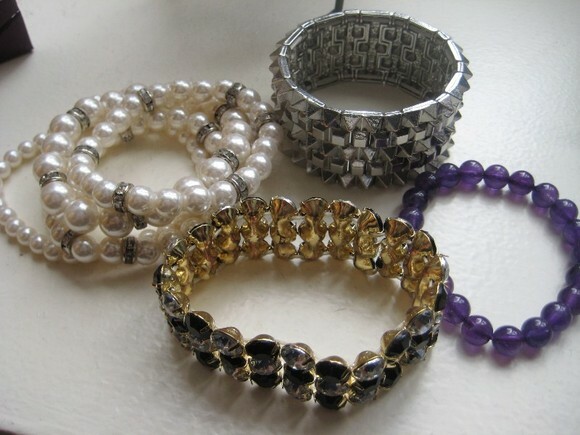 I store my bracelets on top, earrings in the middle and rings on the lower level. My favorite bracelet at the moment is my silver spike cuff. All of these bracelets are for Forever 21 except the purple crystal bracelet which was purchased at a crystal factory in China. Love Forever 21 earrings. 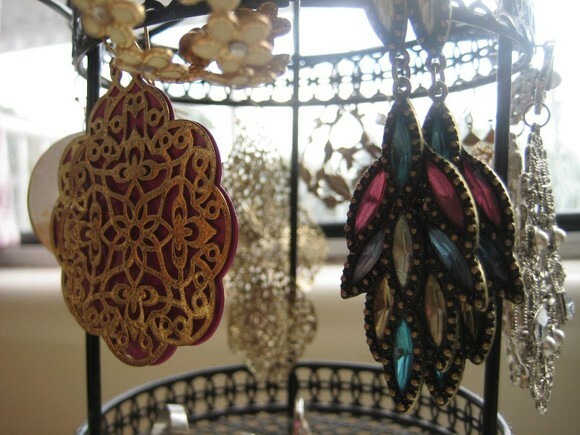 My go to pair of earrings are the big gold leafy earrings. 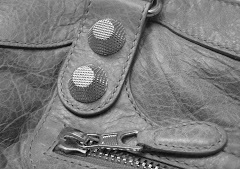 They add a special touch to my outfit without being too overbearing. 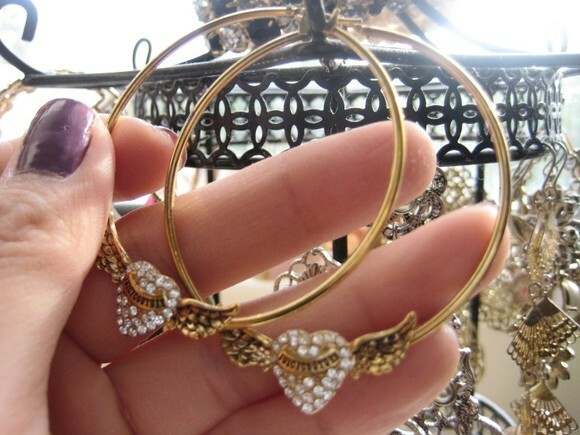 More Forever 21 earrings! I haven't had the chance to wear the multi-coloured ones out. I got these Juicy Couture earrings from a friend on my birthday several years ago. I love these earrings and I almost lost one at the club once! Good thing I found it sparkling on the ground. Ugh.. never wearing these to the club ever again. 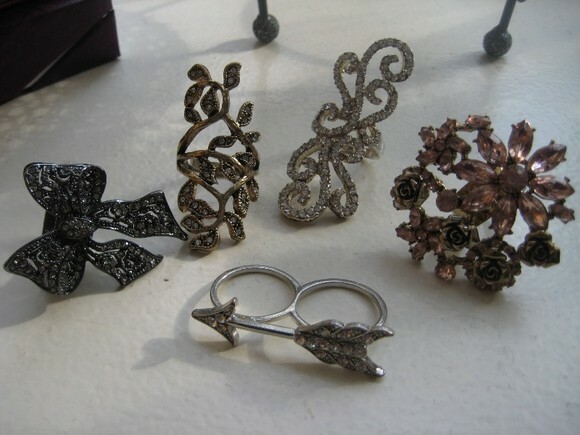 I have a bunch of other Juicy Couture earrings and studs that are not pictured. 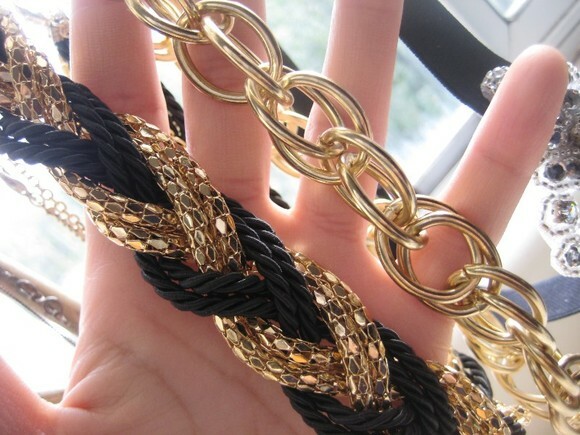 On the bottom level, I have a handful of rings from Forever 21. My necklace stand with some headbands. 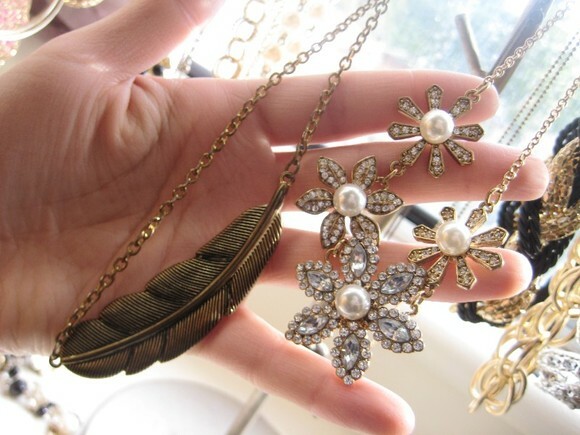 My favorite necklaces at the moment are these two from Forever 21 of course. Aldo headband purchased at the outlet store for $3! 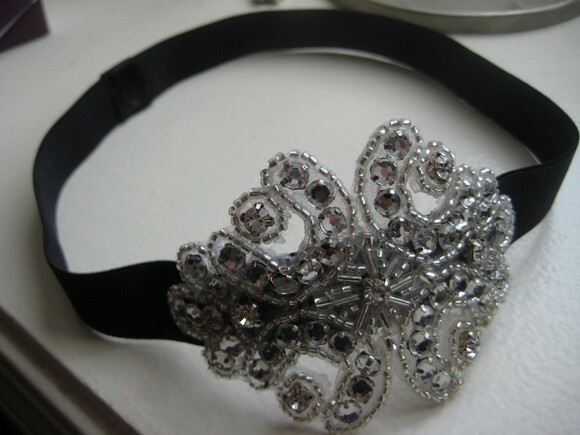 The prettiest head band I ever saw from Forever 21. 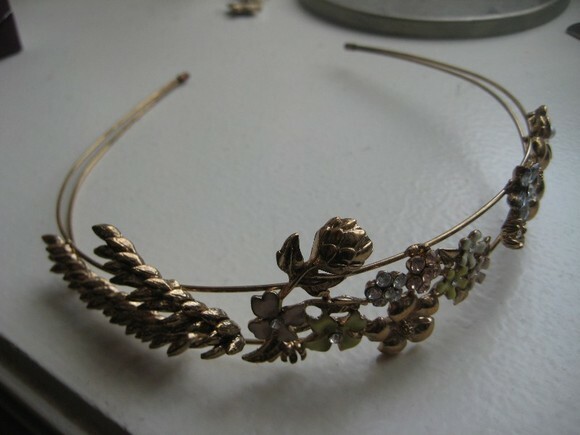 I really love this because I have never seen a headband this dainty and it gives off that ethereal vibe. 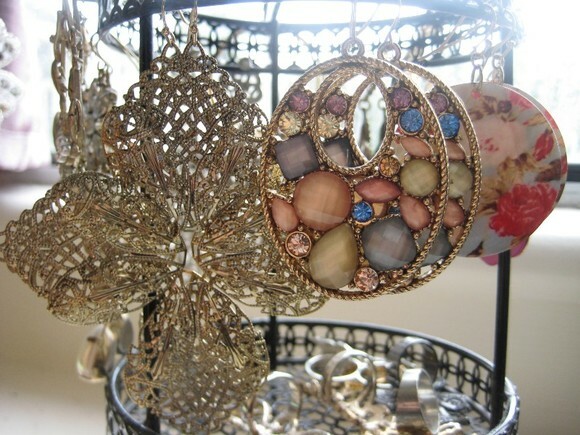 Wow you have lots of jewellery Kerri ;) So nice and neat on those stands! 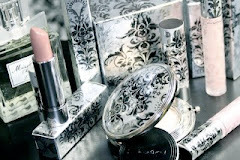 I have only a couple and I leave them on my messy desk :( I should probably accessorize more often! 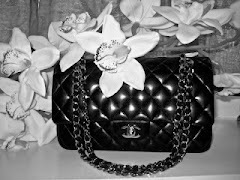 I love looking at other people's wardrobes and accessories! You have quite the collection there, especially with all those pretty earrings!